People who keep their brains active throughout life - performing brain-stimulating activities like reading, writing, and playing games - appear to have lower levels of the protein that forms brain clogging amyloid plaque. Amyloid plaque is used by doctors and researchers to characterize Alzheimer’s Disease. While numerous studies have found associations between being physically and mentally active and having lower risk for Alzheimer’s disease, the researchers in a study published in the JAMA Archives of Neurology produced brain scan images to show that lifelong mental activities are associated with lower levels of amyloid deposits in the brain. The study was supported by grants from the Alzheimer's Association and the National Institutes of Health. Lead author Susan Landau of U.C. Berkeley’s Helen Wills Neuroscience Institute, explained that previous studies have shown more cognitive activity associated with a smaller likelihood of developing Alzheimer’s disease, but that they didn’t use amyloid PET imaging. She noted that previous studies looked at amyloid in the subjects’ brains and “targeted a biological process,” showing an association between life long cognitive activity and decreased amyloid deposits in the brain. The researchers studied a small group that included 65 healthy adults, ages 50 and older, 10 adults with Alzheimer’s disease (recruited from the Memory and Aging Center at UCSF), and 11 younger control subjects, ages 20 to 30. Participants completed mental tests and were interviewed about how often they engaged in mentally challenging activities throughout their lifetimes. Subjects’ brains were imaged using PET scans and Pittsburgh Compound B, a radioactive compound that allows the imaging of amyloid plaques in the brain. While using this type of imaging was useful for this study, professor Landau explained that it’s not feasible for use in a typical medical office or hospital setting because the substance must be mixed by a chemist and injected into patients immediately to prevent deterioration of the substance. So while the researchers could use the compound in their carefully controlled study, it's not something that is readily available. When the researchers ran the data for lifetime cognitive activity, lifetime physical activity with brain imaging results, the most significant association was between past cognitive activity and lower amyloid deposits. They did not find a significant association between physical activity and brain deposits, but Landau concedes that their method of assessing physical activity - using the past two weeks, may have had an effect on their results. “In completely healthy older people about a third of them have amyloid, healthy, no memory problems,” she said, “and the thinking is that they’re probably at much higher risk than normal people without [amyloid deposits]” Landau says that understanding why some healthy people don’t seem to be impaired, even with deposits, is “the million dollar question”. While other Alzheimer’s research has looked at brain volume and genetic factors, unraveling the findings on brain activity and deposits is something that Landau says she hopes will spur more research that will reveal how to prevent or eliminate brain deposits. She also said that research is being done to devise brain imaging methods that could allow doctors and researchers to more easily see what is going on inside our brains. 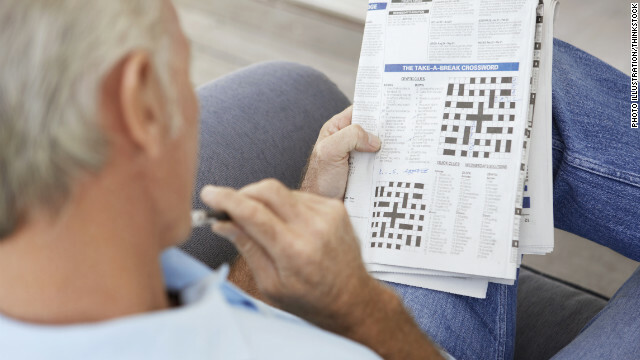 Recent research by Dr. Wilson at Rush Alzheimer’s Disease Center in Chicago has shown that, for Alzheimer’s patients, working at puzzles can help delay the point at which the patient is no longer functional in society. Having been a caregiver to my great grandmother with Alzheimer’s disease, in 2008, I founded PuzzlesToRemember.org, a nonprofit organization that supplies free jigsaw puzzles to facilities that care for Alzheimer’s patients. By now, I have supplied over 10,000 puzzles to over 1,050 facilities across North America. I have also, together with Springbok, developed Springbok PuzzlesToRemember, puzzles made specifically to meet the needs of Alzheimer’s patients. These puzzles receive constant positive feedback from Alzheimer’s patients and caregivers. "Keeping brains active may help fight Alzheimer's plaque" It obviously did not help Ronald Regan. Here was a man who as a actor had to memorize lines and apply the right emotions and facial expressions. As president, his mind would have been challenged everyday. He was also an exercise loving guy. None of that made any difference. Individual anecdotes are meaningless to overall statistics. There are people who smoke 2 packs a day and drink plenty of alcohol who somehow manage to live into their 90's. It doesn't mean smoking and drinking increase life span. There is a nice paper (Soscia et al, 2010 PloS ONE) showing that ilamoyd-beta has similarities with antimicrobial peptides family, and also, it has antimicrobial proprieties. Could be ilamoyd-beta a friend of innate imune response which is helping to eliminate some unknown infection in AD brain? I think this paradigm shifting really interesting, lets see what happens Bye from Portugal. The most important measure in this study–how often the subjects engaged in mentally challenging activities throughout their lifetimes– was based on the subjects' answers to the questionnaires!! But the 10 older subjects with Alzheimer’s disease were suffering from serious memory problems, can their answers be used as a valid measure of their life-long mental activities? Can we really compare their reports with those of the younger, healthy subjects? Is this a "well control study" or another junk research? Definitely an active brain along with an active body are the keys to a longer – healthier life! Sonjay, relative to dementia, someday do a piece on "radiation necrosis" of the brain caused by the radiation treatments given to brain cancer patients.. Radiation necrosis id 100000000 times worse than the glioblastoma and after my wife was was victimized by this horrible form of dementia, although the scns have been stable over the course of the last year, I had just as soon see the cancer come back.. I agree with this blog to a certain extent. Finding ways to improve memory and delay dementia have been popular areas of study for scientists today. The "use it or lose it" idea is believed by many when discussing brain activity. This idea promotes brain exercising . Whether one does crossword puzzles daily, keeps up to date with technological advances, or simply learns something new every day, they are participating in activities that will keep their brain cognitively stimulated. By completing these activities, one's memory is continuously being worked and should improve. WIth this being said, it makes sense that having high cognitive activity will delay the onset of alzheimer's disease. When one stimulates their brain, it should prevent amyloid plaque from forming. However, I believe there are far more factors that contribute to the diagnosis of alzheimer's disease. Just because one has high cognitive activity, does not mean he or she will not still develop alzheimer's disease. According to the helpguide.org, lack of sleep, stress, and genetic factors play a roll in how early one develops this form of dementia as well. Overall, the brain exercising technique may not work for everyone. It has failed at times for some, but it could be worth a shot.